This school year, I’ve made a purposeful decision to bring social media into my high school classroom as a regular part of our learning. From the first day of school, I’ve used Twitter with students, tweeted about school, and encouraged them to participate in connected learning. And while it’s usually been fun, it hasn’t always worked. This week, I reflected back on my plans in an effort to better communicate the power of social media to my students and colleagues. I want to sell them on becoming connected but had to better consider the value for myself, first. Social media, like Twitter, Voxer, and Google+, helps me to connect, collaborate, learn, share, promote, quench curiosity, and so much more. 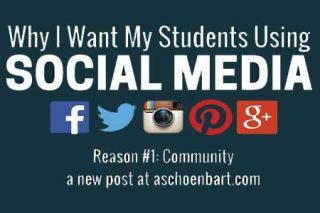 In this post, and a series to follow, I want to investigate the reasons why I want my students to use social media in my classroom and share our challenges and successes. Each post will include a short rationale with some examples from my classes. Throughout the next month or so, I plan to focus on community, connection, promotion, collaboration, and digital citizenship. I use my Twitter account--@MrSchoenbart--for everything. For me, my personal and professional online lives are basically one and the same. But I tell my students they do not need to follow me. Instead, they follow @SchoenTellOHS, our class account where I retweet anything any posts in, for, or about our class. I track this all with the student created hashtag, #SchoenTell. Right there, the community building starts. I belief in the power of a community of learners. When people are able to learn together, share successes and challenges, and build meaningful connections, we do more, do better, and enjoy it. That’s my hope for my classes. In the past, we used Google+ Communities to build a better classroom community, and now we’ve extended that to Twitter as well. Through these tools, we develop a sense of Community because class never needs to end when the 41-minutes are over and learning extends over time and space. With a simple Remind message, Tweet, or Community post, I can communicate, share, and engage learners in a way that was never possible before. And they can share, too. Not all of my students have embraced Twitter. Some enjoy it, others think it pointless, and some are even frustrated at the amount of effort I put into using it in class. But when I get tweets asking about my dinner, favoriting a joke of the day, or wishing someone a happy birthday, I know that technology has extended my classroom community in meaningful ways. Every morning, I tell a joke of the day to my friends on Voxer. Early this year, this extended to my classes, too. I told the joke--the cornier the one liner the better--and almost always get groans in response. But we don’t start class without one. Students love hating on the jokes but it’s replaced the do now in my classroom as a fun way to build community and get ready for learning. There’s a joke for every school day--often themed for the season--and it’s then tweeted out at the end of the school day. Our #SchoenTell community is growing slowly but steadily, but there have been some massive highs along the way. When 60 of my students are all tweeting about the same thing, whether it be Google Expeditions, Halloween poetry, or their #GeniusHour projects, it feels like something special. Some of the my favorite examples are below.